Noor’s song Move Your Lakk will serve us with Sonakshi Sinha, Badshah, Diljit Dosanjh. The pics and videos from the sets have made us all excited. Remember the picture shared on Twitter featuring Sonakshi Sinha and Badshah together? Well, we finally know why the picture was posted. 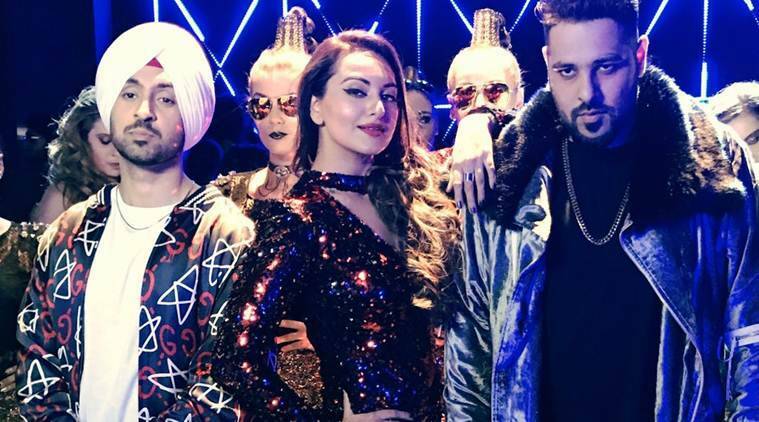 Sonakshi is all set for her film Noor which will have rapper Badshah and Udta Punjab fame actor-singer Diljit Dosanjh coming together for a song titled Move Your Lakk. They shared a picture shot during the making of the video. Sonakshi Sinha, who is the sole audience-puller for her upcoming film Noor, has something entertaining coming up for her fans. We have thus brought here all that Diljit, Sonakshi and Badshah shared on their social media platforms. While shooting for the video, Diljit shared a clip from the sets and captioned it as, “#MYL @badboyshah @aslisona #DosanjhanWala Snap : thisisdosanjh #HatdiNiTu ??????? ?,” we thank Badshah for sharing another picture from the shoot and via the same we got to know that the song is titled as Move Your Lakk or MYL as they are calling it. “Guess who? #MYL #MoveYourLakk #Noor,” shared Badshah. The release date of the song is still not mentioned. They not only showed a sneak peek to the step of the song but Sonakshi Sinha, in a report, also informed that it is a promotional song for her Sunhil Sippy’s film. She also informed that the song captures the spirit of friendship which is an integral part of the movie. Sonakshi will be playing the role of a journalist in Noor, and the film is an adaptation of a Pakistani novel titled Karachi, You’re Killing Me! by Saba Imtiaz. Noor also stars Kanan Gill, Shibani Dandekar and Manish Choudhary. The movie is set to release on April 21.